When working with a dog, I usually start with Tellington TTouch, which is a forward-thinking approach to training and rehabilitation. Developed over thirty years ago by internationally-recognized animal expert Linda Tellington Jones, TTouch recognizes that physical, emotional and mental balance are inextricably linked and that it is therefore possible to influence emotional responses and behaviour by relieving tension in the body. It uses a combination of specific touches, body wraps and leading exercises to increase confidence, calmness, self-awareness, mental and physical balance. The emphasis is on working with animals through communication and respect, following the principles of using direction rather than correction, containment rather than restraint and influence rather than control. TTouch is a toolbox of techniques, which means there is always something that can help a particular dog. As well as confidence building and reactive behaviours, TTouch can help animals with a range of behavioural issues, including anxiety, noise sensitivity and fear of fireworks, poor coordination and lack of balance (including pulling on the lead), problems with handling and grooming, separation issues, mouthing, excessive barking, chewing or licking, car sickness and travel problems, excitability and hyperactivity. It also improves performance and physical balance and, as such, is ideal for show dogs and agility dogs. It enhances the relationship between animal and owner, and is a very gentle way of teaching young animals to enjoy handling, including around the mouth, feet and nails, and of providing comfort and relief for older dogs. It is easy to learn basic TTouches - no knowledge of anatomy is needed to effect change, and no harm can be done. A key part of my role is therefore to teach you some TTouch so that you can use it yourself with your dog. TTouch is very compatible with other reward-based training methods such as clicker and, where appropriate, complementary to veterinary treatment. In addition to TTouch, I use a range of training approaches,including clicker training. I only use methods that ensure both dog and owner feel safe and have choice. Real learning cannot be forced. 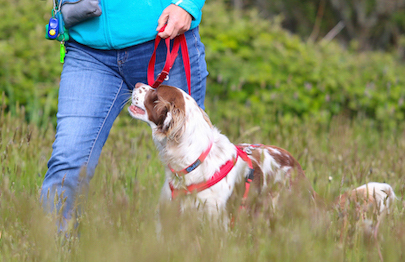 The training methods I use are based on well established scientific principles of how dogs learn, and focus primarily on reinforcing the behaviours we like, while withholding reinforcement when they do things we don't want. You do not have to dominate your dog to train him or her - nor do you have to jump through hoops to try to be the "pack leader"! What you need is the consistent application of kind, effective, scientific principles - and I will show you how you can achieve this. I will never coerce, hurt, or frighten your dog in the name of training. I also use leadership and life coaching techniques to help you build your own confidence. 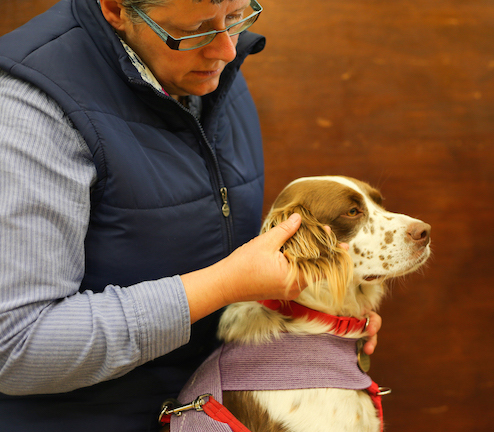 Owning a challenging dog takes its toll on our own confidence and, when you are stressed yourself, it is hard to help your dog become more relaxed. Coaching can help you to understand how stress impacts on you and make positive changes in your outlook and behaviour. By reframing the situation, you can move beyond the thinking that is holding you back and move forward to achieve your goal of having a happy, calm dog.